The Fertile Crescent is the region in the Middle East which curves, like a quarter-moon shape, from the Persian Gulf, through modern-day southern Iraq, Syria, Lebanon, Jordan, Israel and northern Egypt. The term was first coined in 1916 by the Egyptologist James Henry Breasted in his work Ancient Times: A History of the Early World, where he wrote, “This fertile crescent is approximately a semi-circle, with the open side toward the south, having the west end at the south-east corner of the Mediterranean, the centre directly north of Arabia, and the east end at the north end of the Persian Gulf.” His phrase was widely circulated through the publications of the day becoming, finally, the common designation for this region. The Fertile Crescent is traditionally associated (in Jewish, Christian and Muslim faiths) with the earthly location of the Garden of Eden. 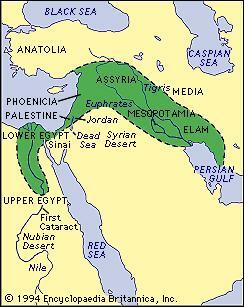 The region changed hands many times through the ages. By 600 BCE the Assyrians controlled the Fertile Crescent and, by 580, the Neo-Babylonian Chaldean Empire under Nebuchadnezzar II ruled the region. In 539 BCE Babylon fell to the Cyrus the Great after the Battle of Opis and the lands fell under the control of the Achaemenid Empire (also known as The First Persian Empire). Alexander the Great invaded the area in 334 BCE and, after him, it was ruled by the Parthians until the coming of Rome in 116 CE. After the short-lived Roman annexation and occupation, the region was conquered by the Sassanid Persians (c. 226 CE) and, finally, by the Arabian Muslims in the 7th century CE. and attacks from neighboring communities. wagon, arch, potters wheel, and sundial were all invented by the Sumerians.